New Smith Family Website click here. The new and latest news for Smith Family Webiste is on the new website. Use the link above to go there. This website will eventually be removed. The real latest news here is that this old site is nearly gone and in fact this page is about the only thing left in here. All of the news below is really old news. Go to the new website and check the new webpage for the latest news about our family and are new website. Videos for MLRS rocket artillery battery at Fort Chaffee made good impression. We sold a number of videos. At this time we are working on the S.F.V. 1999 video here in the studio. We also have a studio web cam and when we are working in the studio on productions and on line at the same time the web site picture is updated once every 5 min. Expect most active times to be weekends. I use the same computer to generate graphics as well as edit video so if we are using the computer for these the web cam can't be on line. I will try to keep an interesting picture on there when we can't be on line and may change it every now and then using a video tape image. I don't do all the editing with the computer though and when I am editing what ever is selected on the video switcher can and may be sent right out to the studio cam page. VACATION 1999 was a blast. We went to Branson, MO and this year's vacation video should be the best ever. This year the girls intend to start out with a space theme as they come from deep space to visit the earth, a place called Branson, MO. With Kristy at the controls there is no way of knowing just where they will end up before the trip is over. Keep an eye on the sky and if you happen to see a UFO that looks like the pilot doesn't know how to fly it, well that just might be Kristy and Laura looking for Branson, or some other vacation spot, who knows? I intend to get graphics and even animation's on here soon but we can't really get to work on the actual video until we are finished with the kitchen and the MLRS video job. As always anyone who wants one of these videos can send us an e-mail and make a donation of $10 with $3 s&h to Rainbow Productions, P.O. Box 6681, Fort Smith, AR 72906. All donations go right back into Laura and Kristy's production fund including the cost of materials like buying the blank video tapes. I hope to have more info here on our last vacation soon. If you place your pointer over a picture and see a hand appear you can click on the picture and view a short AVI file that is related to the source of the picture. Yes that's us at the Valley of Fire North of White Sands in New Mexico. I thought it might be a good picture of us to put on our front page here because there are very few pictures with all of us in it. 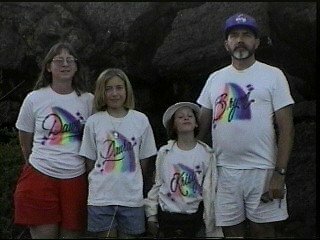 To top it off we all have on our rainbow shirts with our names on them. This picture was captured from our home video. The past two years we have had some really interesting adventures mostly on our vacations. 1997 found us in Florida and the Bahamas. 1998 found us in New Mexico the land of enchantment. 1999 found us in Branson, MO. Today is 12-25-1998 at 8:30 AM. I'm here building this web site on Christmas morning. Our day started rather early today, somewhere around 6 AM and usually on days that the girls don't have to go to school and mom don't have to work we like to sleep until 7 ot 8 AM. Not this morning though because there were noises in the studio that sounded very much like children going through presents. :-) Nothing to do but get up and go see what was going on. We were right, Laura and Kristy were all ready up and ready to open presents. All but the new Yamaha keyboard that Laura got and the new TV/VCR set that Kristy got which were all ready opened. At the moment Laura and Dawn are building a game in the living room and Kristy is playing a new Barbie detective game on her computer in her room.